The weekly spread of your bullet journal is probably one of the most important bujo spreads to get everything you need to manage in your life and get organized. It doesn’t need to contain all the information, but only the priority tasks and appointments. 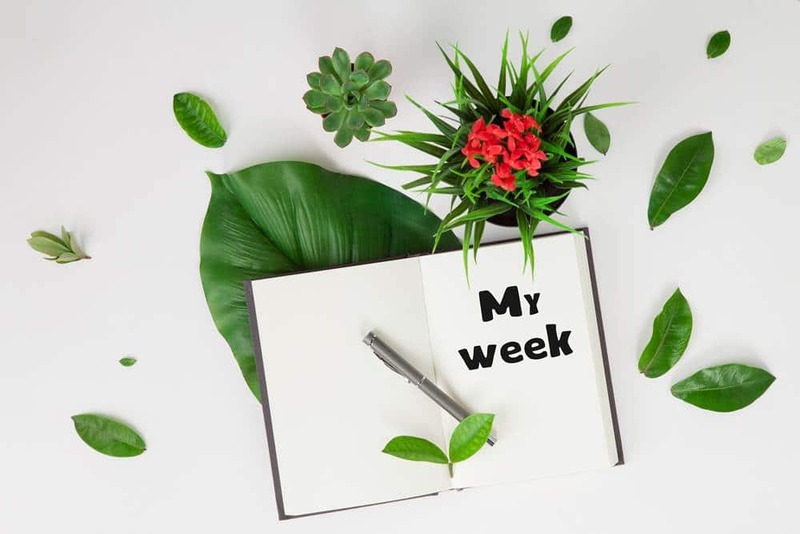 It is the page that you fall back throughout the week to check what has been accomplished and remind you of what needs to be done. But not every week is the same! Some weeks are a lot busier than others, where you need more space to take notes or add bullet points. Some weeks you might need spreads that fit in one page while others may need two pages plus daily spreads to take all of your notes. What BUJO weekly spread you need to use comes down to your agenda, your bullet journal style and the way you want to keep track of your work in a given week. But you don’t have to worry about what your next bullet journal weekly planner will look like. Here in this post you will find lots of inspiration for your weekly journal planner. We also have a post with many Mood Tracker Layouts for you to check here. I haven’t experimented much with one page weekly layouts because my weeks are full and I need more space to add notes in my A5 Bullet Journal. However I really like the way it looks to add appointments or only a few notes about your day. /And of course I could not forget to mention one of my most favorite designs, the sideways weekly. Too cool! If you don’t like all the fluff, and want to go straight down to business, then these layouts might be your best options. /As we have mentioned it before, you don’t need to be artistic to have an efficient bullet journal and this weekly spread here is an example of how you can make a minimalist and beautifully looking spread without any drawings on it. This is where I am normally at with bullet journal weekly. I like to keep the simplicity and some aspects of the minimalist spreads shown above but also like to stick to my monthly theme and add a few creative items. /You don’t have to add any doodle or theme to your weekly spread. It is totally up to you. I just like to keep the momentum going since I pick up themes to my bullet journal month based on things happening in my life or the season ahead. /These weekly layouts are not very hard to replicate if you are willing to get out of your comfort zone and try some new Bullet Journal Supplies. Like a new lettering font. I personally don’t use the month calendar in my planner weekly layout since I also have monthly spreads in my BUJO. /But I can see how powerful it can be depending on how your tasks relate to each other or repeat each week. /One of my all time favorite BUJO Instagram accounts to follow adds the monthly calendar to their weekly spread and their posts are just candy to my eyes. I love the clean look of their weekly spreads with that little bit of color. /It can also be a matter of preference, some printable weekly planner spread I have used in the past did show the month calendar in the week pages. I always use blocks if my journal doesn’t have grid dots. It is so much easier to organize thoughts and not to go all over the place when you add blocks. /That being said I think that it is a better spread to use when your weeks look similar to each other, when you have roughly the same amount of tasks to put down on your BUJO every week. /Because the only disadvantage is that it limits you on the amount you can write for each day. Say something unexpected came out, you might have to add a note area just in case. /However you don’t have to be afraid to try blocks in your bullet journal weekly planning. Like in any planner, mistakes and lack of space can happen any day, regardless of how much you had planned to use it. So just try some of the inspiration below and you should be fine. Here is where imagination is the limit. /If you have been bullet journaling for a while you might want to give that little extra personalization. Or heck, even if you are a baginner. /Well, most people may not have the time, drawing and coloring skills to attempt some of these spread. But they sure look good. What I love about Bullet Journal is that it is yours to keep and cherish plus a place where you have total autonomy to let your creativity run wild! /I wish I could make all my spreads look this pretty but that is not the truth (yet!). However, it is just a matter of learning the techniques and practicing. /What is your favorite weekly spread so far? Please let me know in comments below. /And as always tag us #merakimother on Instagram for a chance to be featured in our Instagram Account and maybe here in the blog too. Hi! Just loved the ideas… I think I’ll try the sideways and the other one with little yellow lamps right away. Thanks! Love to hear this Malu. Be sure to take some pictures and show us.